When you go home, tell them of us, and say “For your Tomorrow, we gave our Today”. 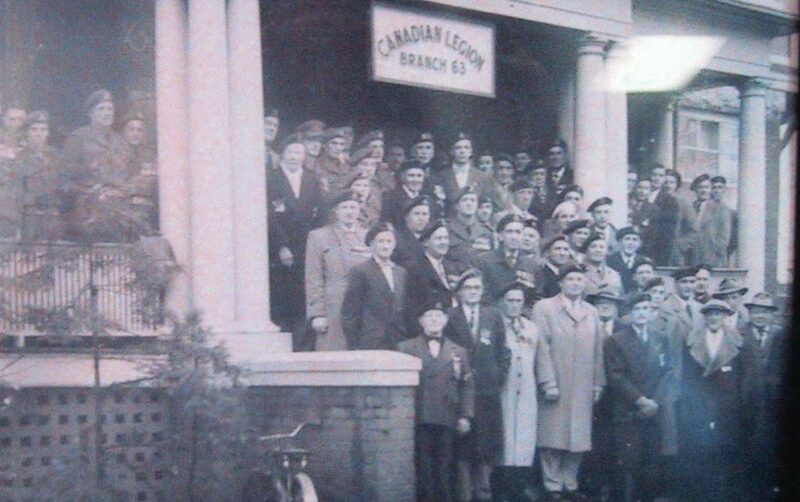 veterans of the wars, in which Canada has participated, the Canadian Legion of the British Empire Service League, was represented in Collingwood by Branch #63. There seems to be some confusion as to the real origins as other accounts claim the Branch was spawned by the Great War Veterans Association back in 1919. Apparently this local branch of the GWVA disbanded in 1922 but the need was again realized in 1925 and the local branch was revived. 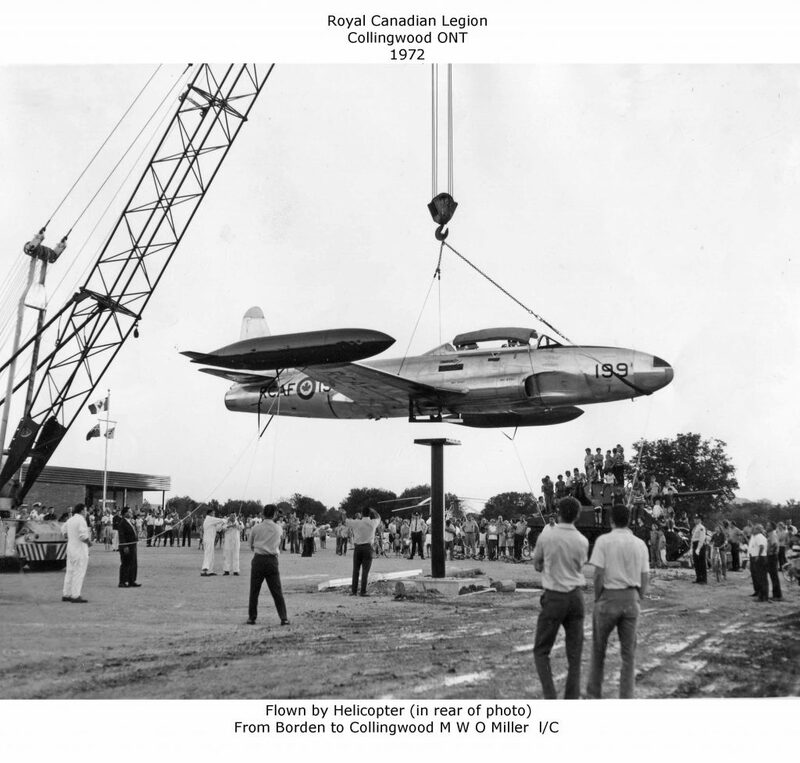 There were bigger things to come and about that time a move to bring all veterans together spread from coast to coast and the Canadian Legion was formed. The branch received its charter on September 21st 1926, and Branch #63 Collingwood was born. The battle to keep up membership in the fledging years was constant as the veterans grew older and the ranks became depleted by the grim reaper. A few years prior to WW II, the Legion occupied two rooms in the old Stephens’ block above the Bell Telephone office. Along came WWII and the old soldiers pitched right in and laid plans for the inevitable membership increase. A year after VE Day, Branch #63 purchased a brick building on Simcoe Street, adjacent to the Enterprise-Bulletin newspaper office. This site served the purpose for only a short time. The membership surged to three hundred and it was time to move again. The old building was sold to the Loyal Orange Order and the old Dr Maitland’s home and office on the corner of Pine and Second Streets became the new Branch #63 Hall. The membership again mushroomed and the members decided to commence construction on a new building. There was not enough ready cash to complete a new hall, but a substantial basement was built with a temporary roof that served as compact but comfortable quarters for several years. Today it is still fondly remembered by the local population as “The Hole in the Ground”. It was growing pains again for Branch #63 and this time the far seeing members took the bull by the horns and went ‘whole hog’. The decision was to build a new, modern hall with all the necessary facilities. It was a step viewed with skeptical alarm by quite a few members and out-and-out opposition by others. However, it was the best decision ever made by the Collingwood Legionnaires. 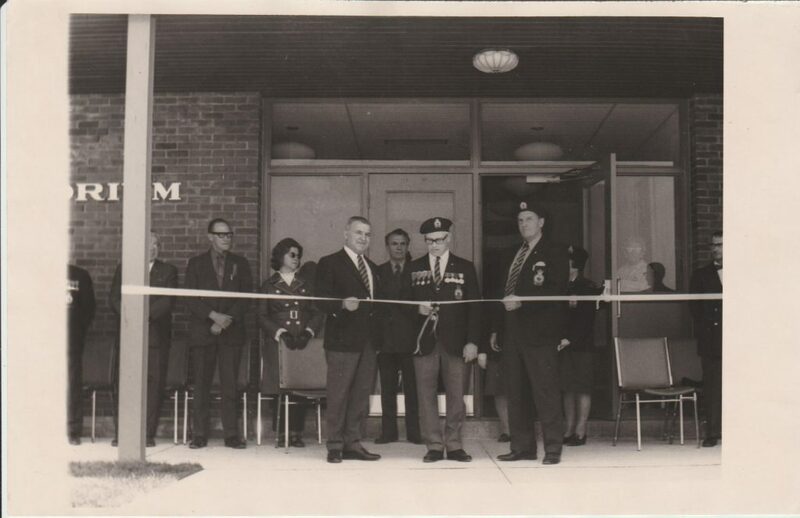 With the money from the sale of the old property and a loan of one hundred and twenty thousand dollars (backed by notes signed by the members themselves), the new hall was erected on the site of the old stone quarry at the east end of Ontario Street (our current home).The building was officially opened in the spring of 1971 by Chester Merriam, the Legion’s Dominion President at the time. It was the culmination of five years of efficient cooperation and good management with lots of hard work thrown in but in the presence of many Legion dignitaries, including Provincial President Dave Capperauld, the mortgage was burned and Branch #63 was clear of debt. Branch #63 expanded again in 1983 with the club room, board room, general recreation room and an office added to the west side of the building at a cost of three hundred and fifty thousand dollars. A revitalization of the hall and its amenities led to its renaming. The Normandy Room is now a prime site for many wedding receptions and banquets such as the Robbie Burns dinner, Green Beer Day, Ladies Auxiliary activities and sales , Monday Night Bingo, plus other community events. It has become a major source of revenue to allow us to continue to support our commuinity. Branch #63 is proud of its Ladies Auxiliary. The Auxiliary was formed in 1926, the same year as the Branch, with the first president being Mrs Mary Trott, mother of the first Legion president. The Ladies then and now raise funds through catering to banquets; staging bazaars; bake sales; yard sales; raffles for blankets and quilts, many hand made by the membership; craft shows; rental of the tables for the craft show. They are always ready to lend a hand at your special function and those put on by the Branch. For our military, the Ladies continue sending packages to Canadians serving at home and abroad. Worthwhile projects sponsored by the Collingwood Legion over the years have included the formation of the original Branch #63 Pipe Band; the annual Youth Education Public Speaking competitions, Poster, Poems and Essay submissions through the various levels right up to Dominion Command; weekly bingo games; track and field teams; soccer teams; Midget and Bantam entries in the Ontario Minor Hockey Association; Ontario Minor Baseball Association; sponsorship of Cadet Corps; revamping and cataloguing our growing historical museum; fifty-fifty draws; dances; volunteer service in almost all community endeavours such as the blood donor clinics; the General & Marine Hospital; the Fire Department. One of our recently completed projects was to update our building’s facilities to current accessibility standards for the benefit of all: our Veterans, our members and the community at large. We also recently replaced our roof over the west end of our building. Our first priority of course is to our Veterans. The annual Poppy Campaign supported by the surrounding community provides funds to this end; the Remembrance Day service and Parade are an annual community opportunity to focus attention on all veterans past and present and to remind us of the Canadians still serving in all areas of the world. Branch #63 is a living, breathing, vibrant entity. Membership has come and gone over the years but still we remain. From humble beginnings, with constant hard work, sacrifice and dedication typical of the Canadian spirit, our membership guarantees that we survive to remain a vital part of our community.